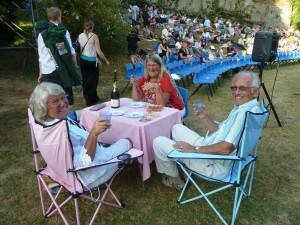 Tartuffe wows audiences at Farnham Castle! Sardines Magazine reviewer Nicole Rose gives Guildburys’ production of Tartuffe 5 stars and so do the audiences ! Really great show, super comedy and so well performed, it was a great evening. We saw Tartuffe at Farnham Castle, It was a great performance, delivered with energy and wit…would recommend it to anyone wanting to be well entertained. Absolutely brilliant!! Wonderful cast and great afternoon! Loved Tartuffe, what a magical evening on Saturday. A group of us went to see Tartuffe last night – it was brilliant. First time we had seen any of the plays by this group, and I just wanted to say how professional everyone one was. I absolutely love it when the request comes through to review any Guildbury’s production but even more so when its their Summer open-air show at Farnham Castle. Before I start my praise of this wonderful production, setting and actors I must make mention of the fabulous costumes. Each and every cast member looks the part from head dress to shoes and everything in between. It’s rare to see an amateur group with such a wonderful wardrobe and knowing that The Guildburys make all of their own costumes really adds to how special this company is. Diane Nichols and her team should win an award for their hard work in dressing so many actors which such beautifully crafted threads. Every performance in this production was brilliant but special mention must be made of a few who clearly had the audience in the palm of their hands from the start. Orgon, played by Andrew Donovan, was utterly brilliant. His mannerisms, his voice and the way he could not stop touching his wig – until finally he takes it off and throws it down in exasperation – was first class. He is clearly an accomplished actor and his scenes with the family servant Dorine, played superbly by Kathryn Attwood, were among the best. They had a great chemistry where you could feel they wanted to finish each others sentences (and in some cases did) and the comedy of their scenes was up there with any professional famous comedy duo – outstanding. Eddie Woolrich played the part of Damis with a Guy-of-Gisbourne-like naivety. His speech impediment caused the audience to almost laugh before anything really funny had been said and he was a delight to watch. For me, the star of this show was Laura Sheppard – for want of a better expression she was blummin fantastic. The scene where she was luring Tartuffe to seduce her was one of the best scenes in theatre – hilariously funny coupled with such a strong character and as a true professional no words were lost, which cannot be easy when you’re laying backwards across a table. One thing that Director Ian Nichols did so expertly with this show was use the ensemble to their full potential. You could clearly see each of their characters and bringing them out during the interval to entertain the audience with their drum skills was a nice touch. His visions of this show from casting to set were clearly apparent and I have no doubt it will go down a storm at The Minack. Well Done Guildburys Cast and Crew, another outstanding production from a wonderful company.